Clean Up City of St. Augustine, Florida: SECRECY IN ST. AUGUSTINE BEACH: MAYOR O'BRIEN'S McMANSIONS VIOLATING ZONING LAWS? SECRECY IN ST. AUGUSTINE BEACH: MAYOR O'BRIEN'S McMANSIONS VIOLATING ZONING LAWS? Will controversial St. Augustine Beach Mayor RICHARD BURTT O'BRIEN be ordered to tear down one of two McMansions he's building on F Street? Under Florida law since 1934, an illegally built building will be ordered torn down by the government, even if a government official made a mistake. St. Augustine Beach Mayor RICHARD BURTT O'BRIEN is building two McMansions on F Street, one of which may have to be torn down for violating fifteen foot setback requirements. St. Augustine Beach Mayor RICHARD BURTT O'BRIEN was re-elected over challenger Rosetta Bailey November 8, 2016, amidst overt acts of intimidation and false advertising. O'BRIEN's putative campaign manager is facing battery charges for shoving Ms. Bailey in the back at City Hall on Election Day. In October 2016, Mayor O'BRIEN brought an illegal stalking injunction against government watchdog Thomas F. Reynolds, Jr., dismissed by Circuit Court Judge Howard O'McMillen December 7, 2016). As a result of misleading campaign ads, Mayor O'BRIEN signed a consent order approved by the Florida Election Commission May 17, 2017. Despicable secrecy order to City Commissioners from St. Augustine Beach City Manager BRUCE MAX ROYLE. What's going on here? 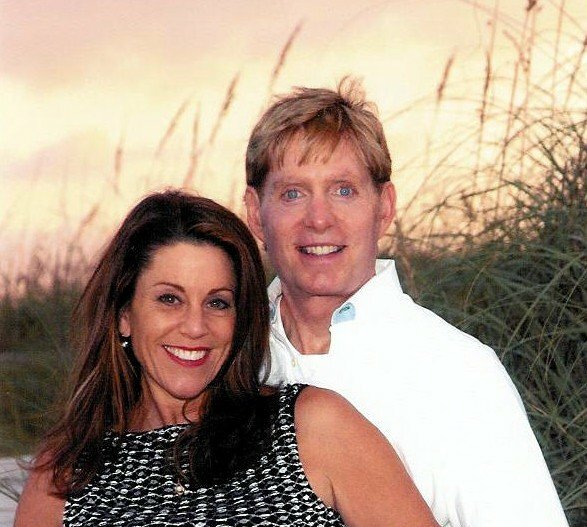 Controversial St. Augustine Beach Mayor RICHARD BURTT O'BRIEN and his wife LAUREN RINGHAVER are millionaire hoteliers. The power couple last year got approval to build two McMansions. Now, one of them allegedly violates fifteen foot setback requirements. Now, he's trying to keep it secret. ST. AUGUSTINE BEACH MAYOR RICHARD BURTT O'BRIEN's cat's paw, CITY MANAGER BRUCE MAX ROYLE HAS DONE IT AGAIN, DEMANDING COMMISSIONERS KEEP THIS SECRET. Mayor RICHARD BURTT O'BRIEN is building two McMansions that violate setback requirements. The attached report is about a setback issue concerning one of the two houses under construction on the north side of F Street, east of the Boulevard. In April, 2016, the Commission approved a conditional use permit to allow the two houses to be constructed in a commercial land use district. A question has come up concerning whether the setback for the house adjacent to the Boulevard meets what was approved by the conditional use permit. To find an answer to the question, I hired an outside consultant experienced in land use matters and planning to find the facts of the matter. He is Mr. Steve Lindorff, formerly the Director of Planning and Development for Jacksonville Beach. His report is attached. In it, he provides background and related information, and a proposed solution. His report will be on the agenda for your June 5th meeting. Mr. Lindorff will be there to present his report and to answer your questions. Since the setback issue involves land use, I suggest that you not discuss it with members of the public or the media in advance of the June 5th meeting. Should you have questions concerning the issue, you can individually speak with the City Attorney and the Building Official. Attached is my draft report and attachments. I have also attached a copy of the invoice for my work. I went ahead and sent this as I have used up the no. of hours that I expected were needed to do a comprehensive job. I will attend the Commission meeting at no charge to the City. Let me know if you want the report in Word format or if an informal meeting is needed with you and others as you see fit to go over the report. On April 21, 2017, Community Redevelopment & Planning Consultants LLC (Steven G. Lindorff, FAICP, President) entered into an agreement with the City of St. Augustine Beach to conduct a review and tender a report of my findings concerning the encroachment into a special 15-foot corner side yard setback for a single-family residence currently under construction on Lot 17, Block 38 of the Coquina Gables Subdivi- sion, also referred to as 16 F Street. The assignment came to me at the request of City Manager Max Royle, who was seeking a professional analysis and opinions of an experienced city planner with no previous connection to the City of St. Augustine Beach. A brief summary of my education, experience, and profes- sional affiliations is included as Attachment F to this report. Cora Johnston, owner of Generation Homes, who is the general contractor and agent for the owner of 16 F Street. Rob Florez of Rob Florez Design, who prepared the sketch site plan submitted as part of the City Commission conditional use permit application packet and the general de- sign for the detailed residential building permit package prepared by others. Randy Worthington of Landtech Associates, Inc., whose firm prepared the survey of the property that was submitted as part of the building permit application and set the corner stakes for the concrete slab subcontractor prior to the start of construction. That the conditional use permit will be transferable and run with the land when the facts involved warrant same, or where construction or land development is included as part of the permit. The time within which the use shall be commenced may be extended for a period of time longer than one (1) year. Failure to exercise the permit by commencement of the use or action approved thereby within one (1) year or such longer time as approved by the city commission shall render the permit invalid, and all rights granted thereunder shall terminate. Transfer of the property by the applicant, unless the permit runs with the land, shall terminate the permit. Whenever the city commission has denied an application for a conditional use permit, no further application shall be filed for the same use on any part or all of the same property for a period of one (1) year from the date of such action. In the event that two (2) or more applications for the same use on any part or all of the same property has been denied, no further application shall be filed for the same use on any part or all of the same property for a period of two (2) years from the date of such action denying the last application filed. The time limits in paragraphs 3. above may be waived by the affirmative votes of a majority of the city commission when such action is deemed necessary to prevent in- justice or to facilitate proper development of the city. LDR Section 10.03.01 Procedures adds that “A conditional use permit shall not be granted if the proposed use will not be compatible with other uses existing in the neighborhood or the proposed use will conflict with the public interest. There are no other code provisions applicable to the development of a single- family dwelling in the Commercial Land Use District. However, in this instance, the City Commission exer- cised its discretion in applying several special requirements in the order granting the condition use permit. contractor, design and engineering professionals, and numerous trade subcontractors. The building per- mit application for the project at 16 F Street lists ten different building trade subcontractors. On the public side, the project falls under the purview of the Building Official, acting as both the Zoning Administrator and the Building Official; and other Building and Zoning Department staff. In this particular instance, be- cause it required a conditional use permit, consideration by the Planning & Zoning Board acting in an advisory capacity and approval by the City Commission. The property was purchased by the current owner in October 2005, and was used as a two-family rental until February 2016 when they filed an application seeking approval of a conditional permit to demolish the existing two-family dwelling and construct two single-family homes on the two lots of record. The conditional use application was then scheduled for a public hearing and consideration of a recommenda- tion by the Planning & Zoning Board at their March 22, 2016 regular monthly meeting. The Building Official transmitted an application packet that included a cover memo, the application form, a departmental con- ditional use handout, a form designating an owner’s agent, a copy of the St. Johns County Property Ap- praiser Parcel Information Sheet, a reduced copy of a survey of the two lots showing the footprint of the now-demolished residential structure, a sketch showing a possible front (south) elevation of the proposed single-family homes, and cut sheets from the LDR’s with Article III Land Use: Type, Density, Intensity and Article XI Boards and Agencies. The PZB questioned the Building Official’s erroneous description, but referred to a map gleaned from the County Property Appraiser’s website. I was unable to find that map, which apparently showed each of the lots to be 50 feet wide and 93 feet deep, which also conflicted with the dimensions shown on the February survey. The Building Official agreed that the lots were each 50 feet by 93 feet. Neither the PZB or the Building Official noted that the actual parcel included half of the closed 15-foot alley between E and F Streets, nor did anyone indicate that part of the corner lot had been absorbed into the A1A Beach Boule- vard right of way. This uncorrected dimensional discrepancy was the first of a series of inconsistent infor- mation regarding the actual size of the corner Lot 17, and ultimately lead to the erroneous staking of the building corners and encroachment into the special 15-foot setback established by the City Commission. specific aspects of the use. In the end, The PZB voted 4-2 to recommend that the City Commission deny the application. On April 4, 2016, the application for the conditional permit was considered by the City Commission. The packet information presented to the Commission included an aerial photo of the site and surroundings, an undated and unsigned sketch site plans for Lot 15 and Lot 17, architectural rendering sketches showing possible front (south) elevations, a photo of the existing residential building, an architectural rendering showing the possible A1A Beach Boulevard (west) elevation, and an annotated copy of the Ancient City Surveying February 19, 2015 survey. Note that the south and north lot line dimensions for Lot 17 differ from the Ancient City survey by 2.61 feet. My review of the documents for this report indicated that the Rob Florez residential design firm was responsible for preparing the two site plans including in the Commission information packet. I interviewed Mr. Florez by phone and he stated that he did not have a map prepared by a land surveyor in his files at the time he prepared the sketch site plans. Instead, he stated that relied on the dimensions shown on the St. Johns County Property Appraiser’s GIS map (Attachment C). However, that map shows the south line to be 49.34 feet (not 49.5) and the north line to be 49.2 feet (again, not 49.5 feet). The Property Appraiser map does not show the alley abandonment. So, again, there is a lack of consistency in what the various parties used for the width of Lot 17. Recognizing that Mr. Florez’s work was based on incorrect lot size information, it is noted that the sketch site plan for Lot 17 (Attachment B-2) was basically laid out mathematically. The property owner and gen- eral contractor selected a 27-wide floor plan that they believed was suited and would fit well on a 49.5- foot wide lot. Hence, allowing for the required 7.5-foot interior (east) setback and a 27-foot wide structure yielded 15 feet left for the westerly corner side yard setback that was shown. Using the same methodology and applying the Ancient City survey south dimension of 46.89 feet, the “leftover” amount shown on the sketch site plan for the west side setback would have been 12.39 feet. Later in this report, I’ll discuss an additional survey submitted with the building permit application that shows another set of dimensions. was generally agreed per the City Attorney and City Manager that site plans were not required to be submitted with the application. The only mention of a 15-foot setback prior to the public hearing came from Ms. Johnston with Generation Homes, who stated that “Lot 17 had 27 feet from the rear of the property with 15 feet on the sides”. This seems to be a misstatement since the sketch site plan shows 15 feet on the west side and 7.5 feet on the east side. During the public comment period, the speakers were mostly supportive of the conditional use permit, and no speaker mentioned the 15-foot corner side setback shown on the sketch site plan. That the property remains single family use unless and until the City Commission rules otherwise. That the renderings are attached with the conditional use permit and the structure shall substantially conform with the respective renderings. That lush landscaping with a four-foot buffer at the 15-foot line and maintained along the side of the property adjacent to A1A Beach Boulevard. It appears from a careful reading of the development order in comparison to the approved motion that the author(s) took quite a bit of license in crafting the final wording. A strike-out/underline version of the list of conditions shows the language that was added or eliminated. To approveThat the application for a property remains single family use unless and until the City Commission rules otherwise. That the renderings are attached with the conditional use permit on 810 F Street, Lots 15 and 17 with the conditions that it maintains a residential single- family family use, hasand the structure shall substantially conform with the re- spective renderings. That lush landscaping with a four-foot buffer at the 15-foot line, the and main- tained along the side of the property adjacent to A1A Beach Boulevard. While some of the changes attempt to bring some clarity to original wording, others could create enforce- ment issues in the future as City staff seek to interpret the intent. For example, in #1, there is no reason- able scenario that might lead to the City Commission revoking the permit, especially in light of #3 which states that the permit runs with the land. The same comment holds for #4. To not provide a waiver of the requirement that a conditional use permit “shall be nontransferable and granted to the applicant only” sets up a situation where any sale of a conditionally-approved single family home would require an oner- ous renewal of the use approval for the new owner. The first #2 is probably okay as long as a landscape plan is submitted and the staffers charged with enforcing the condition are allowed sufficient latitude in determining “substantial conformity”. The second #2 generally mirrors the wording in the approved mo- tion, but still uses the debatable term “lush” to describe the quality of the desired level of the landscaping. Also, although it reads the same in both the motion and the order, it refers to a “four-foot buffer at the 15-foot line”. It appears from the discussion at the meeting that the Commission was seeking a four-foot tall (vertical) buffer at some location within the corner side setback. A more precise description of the intent would be helpful to the enforcement staff down the road. More importantly, the author of the order added an entirely new #5. While the wording in #2 couches the “15-foot line” in relation to land- scaping along the west elevation of the structure, the new clause raises the apparently erroneous 15-foot setback shown on the sketch site plan for Lot 17 to a hardline requirement. No similar requirement has not been imposed in the past, and there doesn’t seem to be a compelling public interest to be served by imposing one at this location. This document became the applicant’s official site plan which was included in the building permit appli- cation package submitted by the general contractor, Generation Homes, to the Building & Zoning Depart- ment on November 1, 2016. After the plan review and approval by the Building Official, the building permit was issued on November 8, 2016. I was able to find only one other document in the building permit file that addressed the building setbacks. This undated and unsigned document is labeled “Specifications” (Attachment E) is purported to have been filled out by Generation Homes personnel. The setbacks listed mirror the setbacks shown on the Landtech survey and site plan. The first reported building inspection was for the slab on December 2. 2016. This would have been the first time the City might have taken note that the setback was less than the 15 feet specified in the condi- tional use permit. It should be noted that the field inspector would not necessarily have direct knowledge of an unusual building setback. This would be especially pertinent if this information was not included in the building plan set kept on the jobsite. The latest inspection report in the file was for roof and wall sheathing on February 24, 2017. Subsequently, sometime in April, City staff received an inquiry (report- edly from a City Commission member) about the location of the building on Lot 17. Staff then determined that it was being constructed with a west side setback of 12.1 feet instead of the 15-foot setback specified in the Order Approving [the] Conditional Use Permit. The responsibility for ensuring that a development project is constructed per the applicable codes and ordinances is a shared one. In this instance, the property owner and his agent, Generation Homes, were engaged in the project from its outset – application and approval of the required conditional use permit through building permitting and the start of construction. They were present at both the PZB and City Commission meetings leading to the approval of the conditional use permit. They should have provided a better level of quality control over their design professionals to ensure that the building permit application materials matched up with the conditions of approval established by the City Commission. Code.” Hence, “the buck stops” at the Building Official’s desk. to expect that a mistake won’t occur from time to time. o Conformity of the proposed development with the comprehensive plan, this Code and other applicable regulations. As stated, the Building Official has the authority to delete items that are deemed to be not applicable, however, a stricter following of the concept plan guidelines in packaging applica- tions for conditional use permits may have alleviated the PZB’s position that they were not given sufficient information regarding the Lot 17 proposal to tender an affirmative recommendation. Their recommendation may even have included advice to the Commission on imposing special conditions. Certainly, having even a sketch landscape plan would have led to a more definitive special condition than the one that is included in the approved order. Information sheets pro- vided to potential conditional use applicants should be revised to include the LDR Section 12.06.06 requirements. confusing terminology used in the development regulation business. • All Building Department forms, both internal and external, should include a space for the name of the author and the date it was prepared. Any item that comes over the counter for approval should be date-stamped on every page/sheet. • Obviously, all documents of any kind need to be very carefully vetted to ensure consistency with other submittals and approvals, as well as full compliance with the City’s codes. signature indicating approval. It wouldn’t be a bad idea for the development order to be brought back to the Commission for final scrutiny and approval before being signed by the Mayor and City Manager. This could be handled as part of a consent agenda. • Any order approving a conditional use permit should include a condition requiring that the writ- ten order be included in the application package for a building permit to construct the project. This will provide a secondary reminder to the plan reviewer that special conditions may exist. • The City may wish to consider adding a mandatory inspection following the staking of the build- ing layout by a land surveyor before authorizing the slab to be poured. • It appears that St. Augustine Beach is extremely popular with development interests and its Building and Zoning Department is very busy. The City should consider the possibility of hiring a city planning professional who could also function as the zoning administrator. Adding zoning analysis by a different person could also serve to minimize the chance of an error of this type occurring in the future.